This book was a great surprise for me. 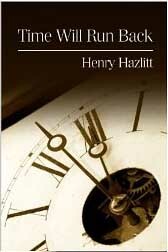 Time Will Run Back was written by one of my favorite economics authors, Henry Hazlitt . His earlier work titled Economics In One Lesson is more or less a text book that read, to me anyway, like a novel. Okay not really like a novel, but I found it to be readable and understandable. When I started reading this book I was astonished to find that this was, in fact, a work of fiction.